Dean Guitars were initially founded in 1976 by a man by the name of Dean Zelinsky who resided in the windy city of Chicago, Illinois. Zelinsky was a luthier but eventually became well known for being an innovator in the design of electric guitars (interestingly, he was the man who designed the spinning fur guitars for ZZ Top's "legs" video) and innovations like custom wound pickups. But after ten years of production, Dean made the monumental decision that he no longer wished to manufacture guitars and sold his legacy to a man by the name of Oscar Medeiros who held rights to the trademark until the mid 1990's. 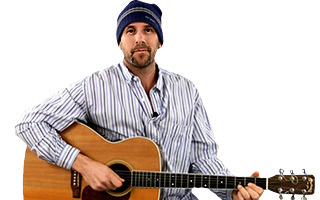 Madeiros, after contributing his own brand of genius to the production of guitars for a period of time then passed the company on to another man by the name of Elliot Rubinson who breathed life back into the faltering company and continues to own and operate the Tampa-based company to this day under the name "Armadillo Enterprises". Despite the fact that the company has changed hands numerous times, quality Dean guitars are still played and cherished by many well known artists ranging from Megadeath's Dave Mustaine to former great Pantera shredder Dime Bag Darrell. The Dean ER SES (or Exotica RSE Supreme) features a Spruce wood top, rosewood back and sides with beautiful abalone inlay on the top trim, binding as well as in the rosette. 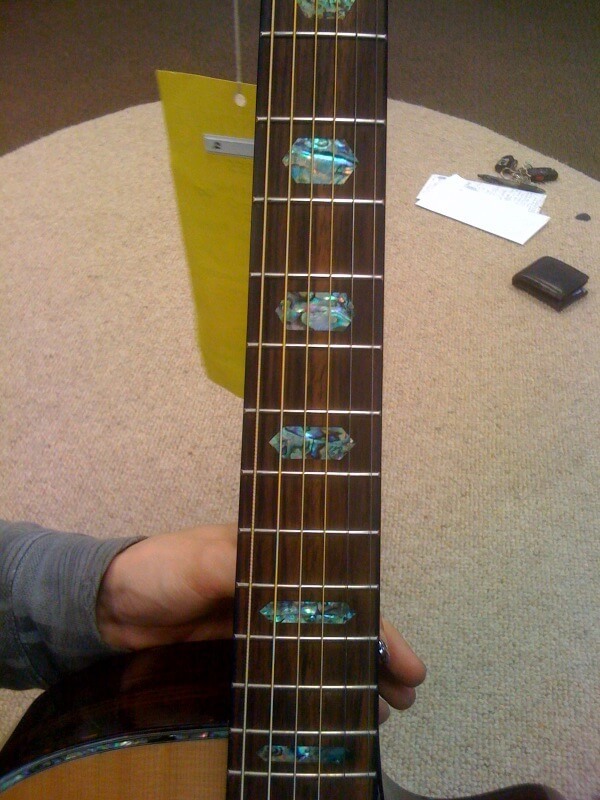 The fingerboard and bridge are both made of Rosewood while the neck is comprised of Mahogany. 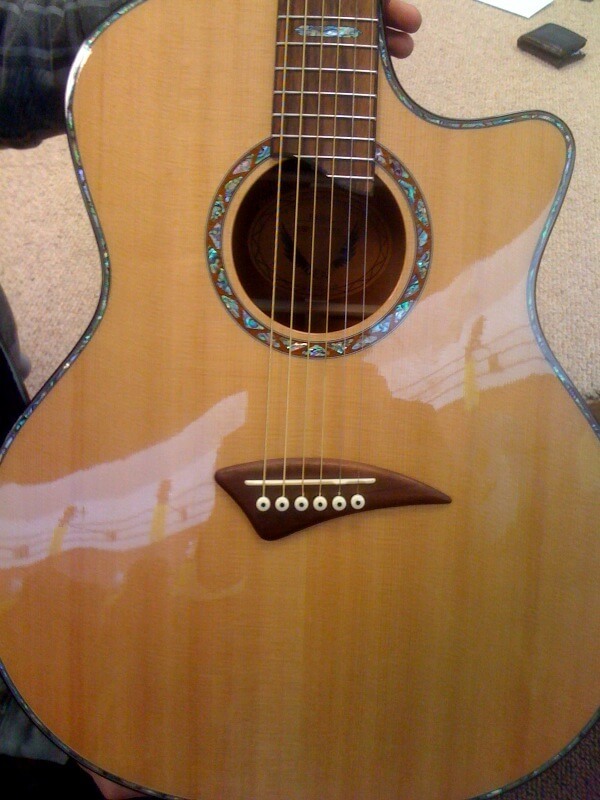 A compensated saddle is also included which seems to be standard fare for new acoustic guitars and helps the guitar stay in tune and maintain solid intonation. The body is sealed in a poly nitro-gloss finish and features Grover tuners on the headstock. This guitar also has an extended fingerboard which contains 23 frets all of which are accessible, and a neck strap button located conveniently on the heel. The button is certainly handy and a great addition especially when you consider that guitars at this price level rarely include such an extra. Dean also boasts what they refer to as an "improved bracing pattern" which simply confuses me. I don't know what the bracing pattern was before or how they've improved it and I've been unable to find out any more information on this topic from anyone in their organization. The Dean ER is 25 1/4 scale length and is 1 3/4" at the nut. It includes the Fishman preamp system as well as a DMT 12 NR four band equalizer. 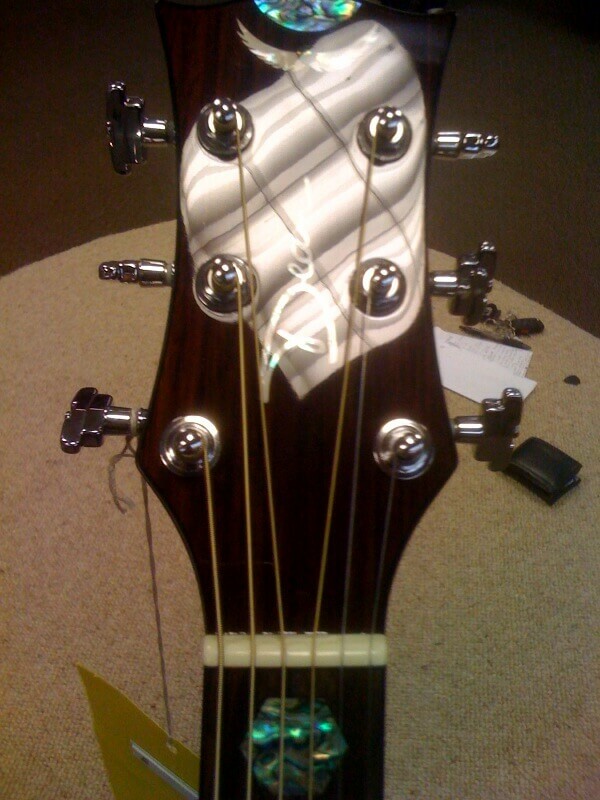 There is also a handy tuner situated at hands-reach for quick tune-ups on the fly. The Dean ER SES is currently available for anywhere between $459 and $599 and is available either directly through the fine people at Dean, through other on-line vendors or through local music outlets. Dean has incorporated some higher quality elements in this guitar and it most certainly draws the eye with its flashy rosette and ornate inlay. It also includes some of the more desirable bells and whistles including the on-board electronics, strap button and tuner. But is this instrument worth the money when compared with guitars in the same price range? Once again I see an acoustic electric that seems to have all of the necessary components to play and perform, and even looks great... but what's been lost in the process? Sadly, I was unimpressed with the Dean ER SES. It seemed to have a sort of muddy sound quality and lacked any genuine ability to produce sound as an acoustic instrument. The sound it did produce leaned towards the bass side of the spectrum but even that element was poorly represented. As an electric instrument it didn't fare much better although some fine tuning seemed to help it to bring out the lighter treble and mid range tones. Regardless, as an acoustic- electric instrument it most certainly did not stack up well against other guitars I've played, even guitars costing as much as one to two hundred dollars less. Yes, the guitar is pretty, there's no doubt about that...but personally I would rather have a guitar that doesn't look so good but plays like a champ, what about you?